Click HERE for photos of the 2017 Club Car! The goal of the Northern Michigan RailRoad Club is to issue, on a yearly basis, a special custom decorated O scale car. 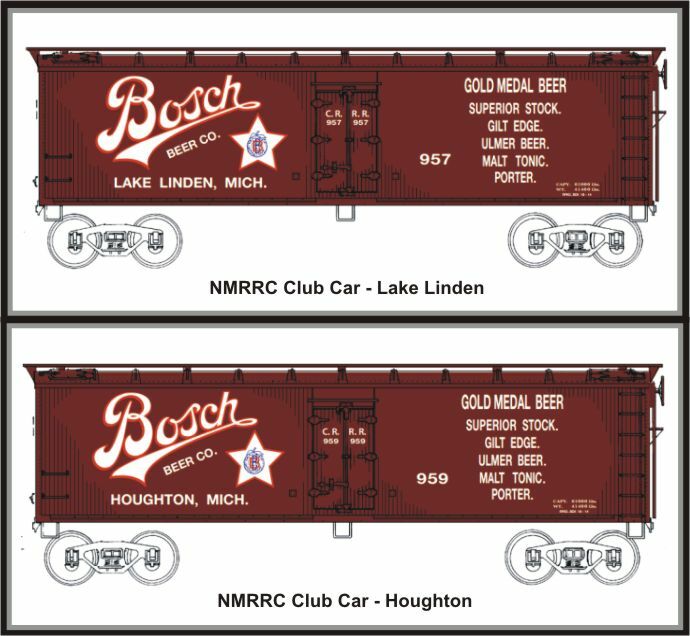 These cars will commemorate railroads that operated in Michigan in both the Northern Lower Peninsula and in the Upper Peninsula. The custom car runs will be extremely limited and will offer cars not previously made “ready to run” in O scale. We plan to make these cars available just before our annual December “Festival of Trains” exhibition in Traverse City. We wanted our cars to be produced with the highest degree of accuracy and authenticity possible. We have chosen Buffalo Creek Graphics, the largest custom decorator in the United States, for producing our cars. Our cars will be built in the USA by Weaver Models. They can be ordered in either 2 or 3 rail versions. Often there are a series of road numbers associated with the car of choice. These cars are being made as a service to our club members, to enable them to have our regional railroads represented on their layouts. Most club members operate both steam and diesel locomotives, therefore we are looking at doing cars from 1930s to 1960s timeframe. For our first car we chose a Michigan Central RR 40’ steel sided double door boxcar. We plan on alternating between Upper and Lower Peninsula Railroads. After the new run is complete, we start planning our next car. The planning committee will then inform members with choices and a vote is taken to select the next season’s car or cars. We have been producing limited edition cars since 2007. Club members who dues are current will have first choice to purchase cars. After a short time period the remaining cars will be sold on the First-come, First-served basis.